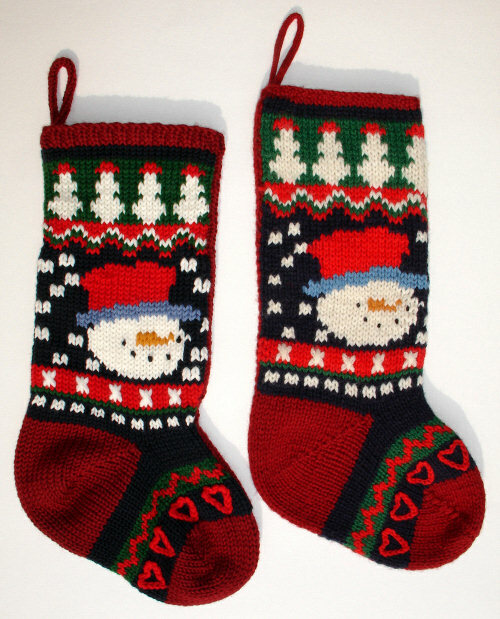 Here are some custom Christmas stockings that I've knit with snowman pictures on them. There are many snowman, and snowlady, pictures around. Snowmen are quite versatile, since they can go onto many different background colors. The colors of the accessories or clothing can be adjusted accordingly. Depending on your taste, they can be very simple pictures, or quite complex. 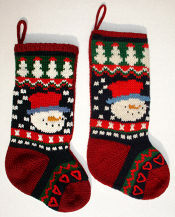 Please look to see what Customers Say about stockings I've knit with snowman pictures. Stockings with pictures that go from top to bottom are somewhat unusual. This design was chosen from a book purchased by my customer. This design is even more unusual in that it wraps around to the back side of the stocking. A birth date was added in the name space on the back. This is the same design with different background colors. The mittens, scarf, and hatband are knitted with fluffy angora yarn for a special touch. This custom Christmas stocking was created to imitate the style of a father's stocking. The child-like simplicity of this snowman picture is very appealing. A very cheerful design in bright colors was a special request for a customer's grandson. The chubby snowman fits the space nicely. A simple design and color scheme make a very striking stocking. The snowflakes sparkle with iridescent white sequins. A small snowman with sequins for eyes and buttons. Beads would work well, also. This was a copy of a family stocking. The snowman on the opposite side has a different colored scarf. I really like this rustic wool, and hope to use it more often in the future. The same snowman has a different look in a different yarn. The same snowman once more, this time dressed up with fluffy angora yarn. The stocking on the right was mailed to me by a customer who wanted me to duplicate it. I was very fortunate to find some wool in very similar colors. The idea of having snowmen in different sizes is unusual and quite effective. This simple design goes back quite a few years. I really like the cheerful look on his face. This snowman picture was knit from a pattern provided by the customer. I have done a similar snowman entirely in angora. The same snowman picture takes on a more feminine look with a light blue background and a decorative top edge. 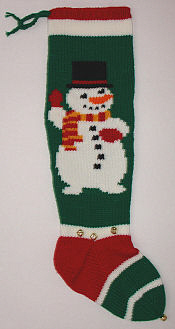 The customer asked for this snowman to be added to a stocking that matched the family style. It is more detailed than most. This snowman design also looks very nice against a blue background, like the snowlady in the next photo. This was knitted from a pattern chosen by the customer. The white sections of the snowlady are done with angora. 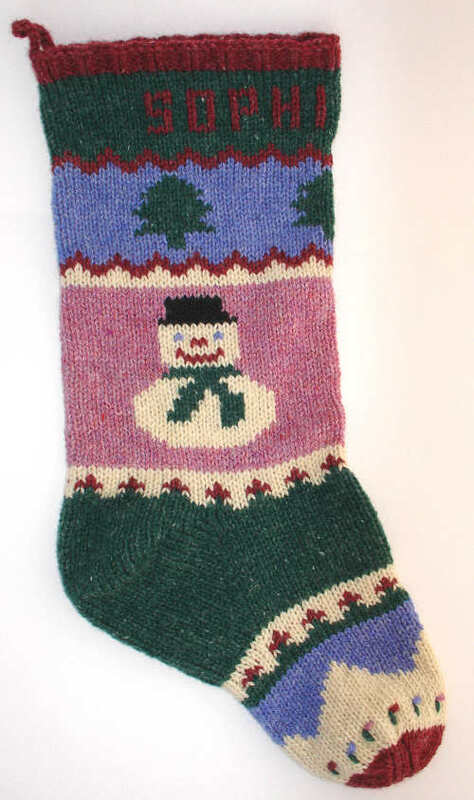 If you're interested in a stocking with a snowman picture, you can find out more about ordering custom Christmas stockings.